I found this recipe on Pinterest, and I've been making it quite often. It's really easy, and the way I make it is even easier than the original recipe because I just throw the ingredients into my breadmaker and let it make the dough. I love these pitas for sandwiches. They're especially good stuffed with tuna salad, avocado and sprouts, but pretty much anything would be good in them. I especially like that the dough can be stored in the fridge, and I can have fresh-baked pitas in no time. Add ingredients to breadmaker in order given and use Dough setting to mix and raise the dough. When the dough is ready, deflate it and turn it out onto a lightly floured work surface. Divide the dough into 8 equal pieces and gently flatten each piece into a thick disk. At this point you can roll and bake the pitas as instructed or refrigerate the pita dough until it is needed. You can also bake one or two pitas at a time, saving the rest of the dough in the fridge. The dough will keep refrigerated for about a week, then just bring to room temperature and roll and bake as directed. Sprinkle the pieces you'll be baking with a little flour and then cover them with a kitchen towel or plastic wrap until you're ready to bake them. Using a floured rolling pin, roll one of the pieces into a circle 8-9 inches wide and about a quarter inch thick. Lift and turn the dough frequently as you roll to make sure the dough isn't sticking to your counter. Sprinkle with a little extra flour if its starting to stick. If the dough starts to spring back, set it aside to rest for a few minutes, then continue rolling. Repeat with the other pieces of dough. Once the oven and baking sheet are hot, place the rolled-out pitas directly on the baking stone or baking sheets (as many as will fit), and bake for about 4 minutes. Carry the pita flat on the palm of your hand and then flip it over into the skillet. 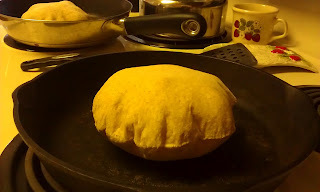 The pita will start to puff up after a minute or two and is done when it has fully ballooned. Remove pita from oven and cover with a clean dishtowel while cooking any remaining pitas. Pitas can also be cooked on the stovetop in a cast iron skillet, but I don't really like doing that. My house gets all smoky! (the one in the picture was baked in the oven - look how it puffed!) If you want to try cooking yours on the stove, visit the original recipe. The last time I made pita I used my sourdough starter. What I love about using the starter is - no packaged yeast! And it's fun. I'm not sure if I'll use the starter to make pita from now on or not, but they turned out great. Mix starter, 1/2 cup water, and 1/2 cup whole wheat flour. Let sit several hours or overnight, until bubbly. Mix in salt and oil, then stir in 1 cup flour. Mix in as much of the remaining flour as you can, and then turn dough out onto floured surface and knead until the dough is smooth and elastic, adding more flour as needed to keep the dough from sticking to your hands or the work surface. Add a little oil to the mixing bowl and place dough in bowl, turning to coat it with the oil. Cover with a cloth or plastic wrap and let rise several hours or until doubled in bulk. When the dough is ready, deflate it (punch it down) and turn it out onto a lightly floured work surface. Divide the dough into 8 equal pieces and gently flatten each piece into a thick disk. At this point you can roll and bake the pitas as instructed or refrigerate the pita dough until it is needed. You can also bake one or two pitas at a time, saving the rest of the dough in the fridge. The dough will keep refrigerated for about a week, then just bring to room temperature and roll and bake as directed..
Storing the Pitas: Pitas are best when eaten immediately after cooking. 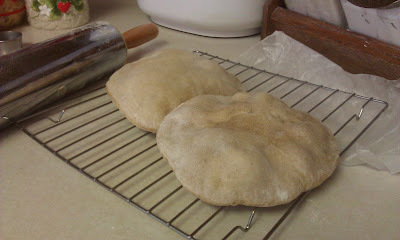 Leftover pitas will keep in an airtight bag for several days and can be eaten as they are or warmed in a toaster oven. 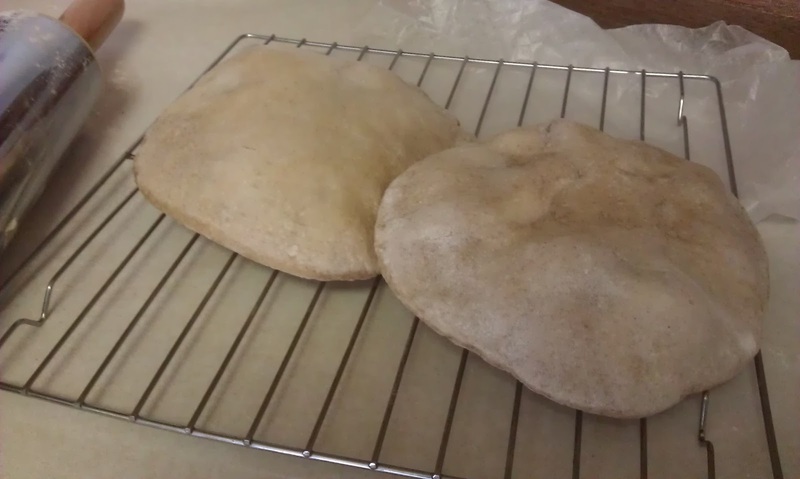 Baked pitas can also be frozen with wax paper between the layers for up to three months. Storing the Dough: Once it has risen, the pita dough can be kept refrigerated until it is needed. You can also bake one or two pitas at a time, saving the rest of the dough in the fridge. 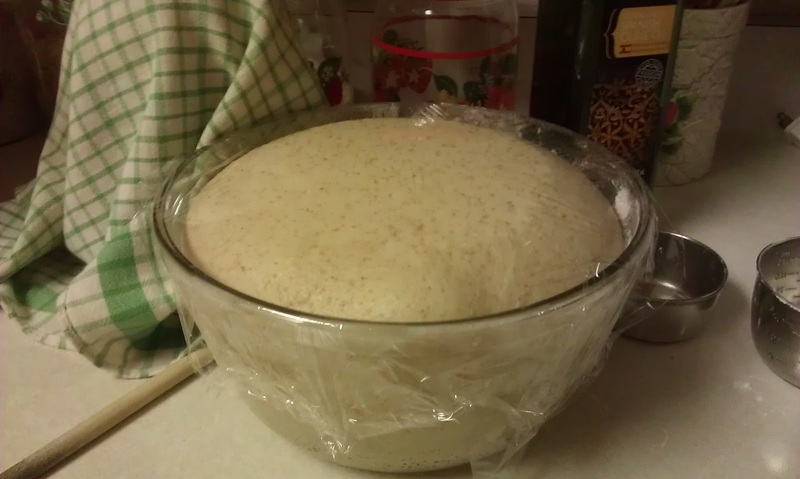 The dough will keep refrigerated for about a week. Pitas That Won't Puff: Sometimes you get pitas that won't puff. The problem is usually that the oven or the skillet aren't hot enough. Make sure both are thoroughly pre-heated before cooking. Even pitas that don't puff are still delicious and can be used wraps or torn into pieces for dipping in hummus.